This has an historical resonance. In Hamburg on Palm Sunday 1786, the composer Carl Philipp Emanuel Bach (1714–1788) conducted a charity concert in Hamburg consisting of excerpts of J. S. Bach and Handel followed by these three works, beginning with the Sinfonia. 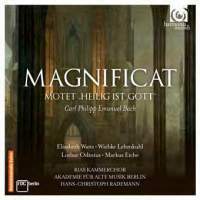 The Magnificat of 1749 had first been performed at the Thomaskirche in Leipzig a few months before his father’s passing. Philipp Emanuel performed it a few more times, then not at all until he revised and performed it in 1779, the last time it was heard until the charity concert. The revised version shortened the choral movement “Et misericordia ejus” by almost half, and it is this version that is heard here. Only Helmuth Rilling has also recorded this revision among the 11 versions of the work known to me (two of them are not available for checking). I first discovered this masterwork when Felix Prohaska made the first complete recording in the earliest days of the Bach Guild label. It was like no other since, with a large orchestra and a majestic interpretation that went all of 49 minutes (three sides originally, later reissued on a single LP). The interpretation is imprinted on my mind, and no matter how much I adhere to historically informed performance practice, I have never found this to be anything but the most impressive way of hearing the work. Still, I bought Geraint Jones (now on CD), Adolf Detel (the most disappointing version, not on CD), Kurt Thomas (now on CD with J. S. Bach’s setting), Philip Ledger (now on CD, similarly coupled), and Helmuth Rilling (now on CD). I missed the next four issues, though I just bought Hartmut Haenchen’s, a live recording made on the 200th anniversary of the composer’s death, an excellent version. He has the broadest “Et misericordia ejus,” but his opening and closing choruses are as fast as any. I also acquired Fritz Näf’s version in Super Audio. It was rewarding to hear these different, mostly fine interpretations of the music, always with Prohaska in the back of my mind. Many of the soloists are outstanding, especially Hilde Rössl-Majdan under Prohaska, Jennifer Vyvyan under Jones, Ernst Haefliger under Detel, Elly Ameling under Thomas (not to overlook all three of her partners), Peter Schreier under Haenchen (and his partners, too), and Helen Watts under both Ledger and Rilling. Thomas has the Tölzer Knabenchor and Ledger has the boys of King’s College for a different sound than that of the mixed choirs on all the other versions. The work is a real showpiece. In fact, its first appearance on records was conducted by Harl McDonald with the Philadelphia Orchestra in 1937, with only the opening chorus, the alto solo, and “Et misericordia ejus.” (How did he manage that? Simple—he was the orchestra’s manager, and he also recorded the Mozart Requiem, both for Victor.) After a rousing opening chorus, each soloist has a virtuoso aria. Around the middle there is a choral number (the one shortened in the revision) and a duet for alto and tenor. The “Gloria Patri” reprises the music of the opening chorus, followed by a gigantic double fugue on “Sicut erat in principio.” As Bach Guild’s Seymour Solomon pointed out, the physical dimensions of the last movement amount to a quarter of the score. No one has ever matched Prohaska’s broadness of tempo, for subsequent versions that I have run from 45 to 42 minutes (on account of the cut, Rilling comes in at 41), so Rademann’s 37:40 is the fastest yet, though allowing for the cut it is only a couple of minutes faster that the norm. His soloists are totally unknown to me, but they acquit themselves admirably. Watts embellishes her line and adds a cadenza, adorning what is already a stylish rendition. Odinius is fearless in tackling the roulades in his melodic line. Eiche tackles “Fecit potentiam” fiercely, but also copes with a demanding line, faster than most versions of this aria. The alto aria, the last movement before the choral Finale, is sung most consistently by all the singers I have heard, and Lehmkuhl is no exception. This is a meditative contrast to the more vehement arias, and it can be a meltingly lovely moment, as Rössl-Majdan first showed. The two concluding choruses are glorious as always, with Rademann’s “Sicut erat” faster than anyone else, even Haenchen and the recent Näf, who had beat out all the others. The RIAS Kammerchor matches the superb work that choruses invariably give this powerful and gratifying music. It must be thrilling to have a part in such a performance. One of the most memorable experiences of my life was singing in the chorus for J. S. Bach’s Magnificat under Charles Munch, but singing in this work might even surpass that for the members of the chorus. Not to forget the rest of the composer’s 1786 concert, he called the aria and chorus (less than eight minutes long) his swansong, though he composed it in 1776, and it is said to have caused a considerable stir in its time. It shares some aspects of scoring with the major work, but I am left cold, perhaps because it is too short to build to a proper effect. It is certainly sung well here. The Sinfonia that opened the concert and closes this program is one of the set of four that were published in Leipzig in 1780. I bought the set of four that Leslie Jones recorded for Nonesuch. (About the same time, Collegium Aureum recorded another set of four, Wq 182, also bought at that time.) The annotator says that this was “probably” the Symphony that was played that day. These orchestral pieces place the composer squarely in the early Classical period. (To think his death preceded Mozart’s by only three years.) The three contrasting works make a good program, as the composer well knew. The Magnificat has never ceased to occupy a choice position in my list of favorites. I don’t even play it too often, since I can hear it in my mind wherever I am. It is good to see a new version in the catalog to attract the attention of collectors who were not even born when the Bach Guild label got started. Buy this with confidence in the conducting and the singing, but most of all in the glorious music that unfolds with their assistance.